Trying to patch up the emotional wounds to his family, Charles buys an old beat up RV and decides to take his two sons, Steve and Jay, on a road trip. Steve brings along his family; wife Jennifer, daughter Olivia and their pet dog. Jay is less than happy about the whole idea but comes along anyway. Finding a couple stranded at the side of the road they offer them a lift to the nearest town. Before they get to town though the RV decides to break down in the middle of the desert as they are on their way to do some sight seeing. Very strange things start happening within the RV and it's not long before people start getting picked off one by one. When they discover just who was the RV's previous owner the strange accidents start to make sense. 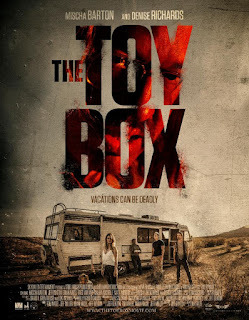 With so many haunted house stories about these days seeing it played out in the claustrophobic setting of a mobile home is a refreshing take on it and I found it worked really well. I have to admit to slightly scoffing a bit when I first read the synopsis but hey, CHRISTINE was awesome and if you can have a movie about a possessed car tyre (RUBBER (2010)) then you sure as hell can have a movie about a haunted RV and make it convincing. I liked the way they introduced the RV's shocking back story whilst unravelling the families sordid history. It has a good cast too; Denise Richards plays wife Jennifer with Mischa Barton as Samantha. Jeff Denton wrote the script and plays older sibling Steve with director Tom Nagels brother Brian playing Jay. Make up/Special Effects artist David Greathouse played the part of the RV's phantom to great effect. With a fitting slasher-esque score by Holly Amber Church there really is a lot to like about this movie. There is one big draw back with this though and it is the build up's to the kills. They are painfully slow and by the time they eventually happen you've just got bored of waiting. That being said there is a high body count, good kills (when they eventually get round to it) and a good amount of blood. The desert setting is suitably bleak and isolating. The acting is perfectly fine but sometimes rather forced and plastic but on the whole an enjoyable movie. The poster artwork is also really awesome.